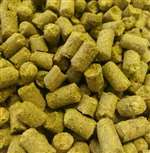 Azacca hop pellets 14%-16% AA Intense and tropical. Sustained impressions of citrus and very ripe mango, with notes of orchard fruit (pears, apples) and pine needles throughout. Originated in Washington, USA. This is the hop formerly known as #483 from the American Dwarf Hop Association, Azacca™ is a new hop variety. It is named for the Haitian god of agriculture.